The U.S. military targeted sites of an al-Qaeda-linked Islamist extremist group, the Khorasan, in Syria by airstrikes overnight after intelligence officials warned this group is as big a threat to the U.S. as the ISIS, or Islamic State, and has the ability and inclination to attack Western targets. The Pentagon said early Tuesday that the U.S. military targeted not only ISIS but also the Khorasan overnight "to disrupt the imminent attack plotting against the United States and Western interests conducted by a network of seasoned al-Qaeda veterans." 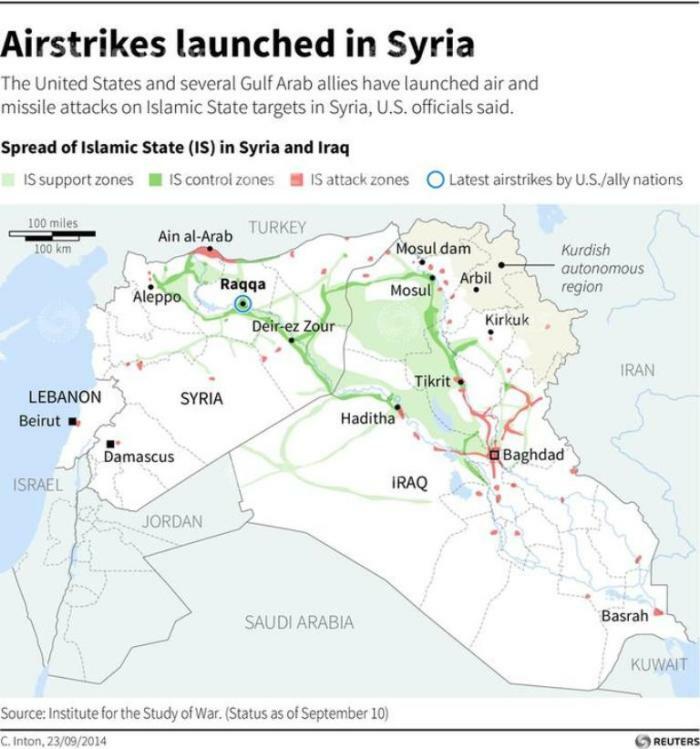 The airstrikes on Khorasan were conducted by the U.S. military alone, but five Arab nations that include Jordan, Bahrain, Saudi Arabia, Qatar and the United Arab Emirates, "participated in or supported" the attacks on ISIS, the Jordanian army said, according to Reuters. This Khorasan group, which had been lesser known in the West until now, is led by a former al-Qaeda commander who was involved in the 9/11 attacks and has the ability to make bombs. "In terms of threat to the homeland, Khorasan may pose as much of a danger as the Islamic State," The New York Times quoted James Clapper, the U.S. director of national intelligence, as saying. 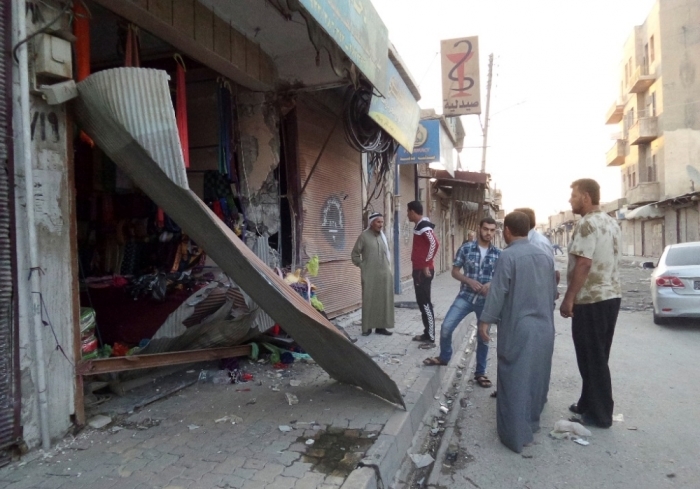 ISIS, which has gained control over large swathes of Iraq and Syria, is also an al-Qaeda offshoot and has been working to form an Islamic emirate in the Levant region through "jihad." The Khorasan is also known to have foreign fighters, including those with Western passports. The leader of the group is Muhsin al-Fadhli, who worked closely with Osama bin Laden and had a prior knowledge about the 9/11 terror strikes. He is a native of Kuwait and is just 33 years old. The members of the Khorasan include al-Qaeda operatives from across the Middle East, South Asia and North Africa. The group was formed just last year out of a cell in Syria that was likely preparing for terror attacks against the U.S. or its installations overseas. As a result of the threat from this group, U.S.-bound passengers are undergoing enhanced security screening at two dozen foreign airports, according to CBS News. Two years ago, the U.S. State Department said in a release that Fadhli was at the time the leader of al-Qaeda in Iran, responsible for "the movement of funds and operatives" through the country to fund al-Qaeda rebels in Syria. Another Syria-based terror group, Nusra Front, has also been identified as a threat to the U.S. and other Western nations. The U.S. has launched over 180 airstrikes across Iraq to fight ISIS militants since August, and is planning for military action, also in Syria, through an international coalition. The CIA estimates that ISIS has about 31,500 fighters across Iraq and Syria, if not more. ISIS, also known as ISIL, is believed to have hundreds of foreign fighters, including those from the U.S. and Europe. Its men have killed hundreds of civilians in Iraq. Numerous members of the Christian and Yazidi minorities have also been killed, and tens of thousands of them have fled their homes. ISIS released a video two weeks ago showing the beheading of a 44-year-old British aid worker, David Haines, the father of two who went to Syria to serve at a refugee camp. The Sunni terror group previously released two more videos showing the beheadings of U.S. journalists James Foley and Steven Sotloff, and has threatened to kill more western hostages.